This was the conclusion of a 25 year old (yes, 25 years old!) single contestant/participant on the first episode of the new series of Married at First Sight when reflecting on her life status. She is 25. She’s single and doesn’t want to be. There must be something wrong with her. Imagine me sitting opposite her in a coffee shop (because that’s what I’ve been doing) and this is what you’d hear me say. There are two options here. Either there IS something wrong with you – in which case, you should fix that – you shouldn’t marry someone you haven’t met before on a reality TV show meets psychological experiment. OR there ISN’T something wrong with you – in which case you shouldn’t marry someone you haven’t met before on a reality TV show meets psychological experiment. Then I would let her pay for the coffee. The more I think about the “maybe there’s something wrong with me” question that has the potential to plague single people of all ages and stages (more so for some than others) – the more I think it’s an question we need to face and not avoid or dismiss. Because the haunting nature of that question has the capacity to powerfully derail an individual in their living of a fruitful and fulfilling life. So single dude, single lady, IS there something wrong with you? No really, is there? Don’t answer “well there must be because I’m single” – think beyond that. Is there anything wrong with you? While that possibility lies unchallenged in your psyche it will have an unhealthy control over your sense of self and could lead you to finding yourself sitting in a limousine questioning whether or not the decision to marry someone you’ve never met is a good idea. Or making other very bad decisions in life and love. Find out if there’s anything wrong with you and work to fix it. Get that question off the table. It might not change your relationship status but it will change your perspective on it. 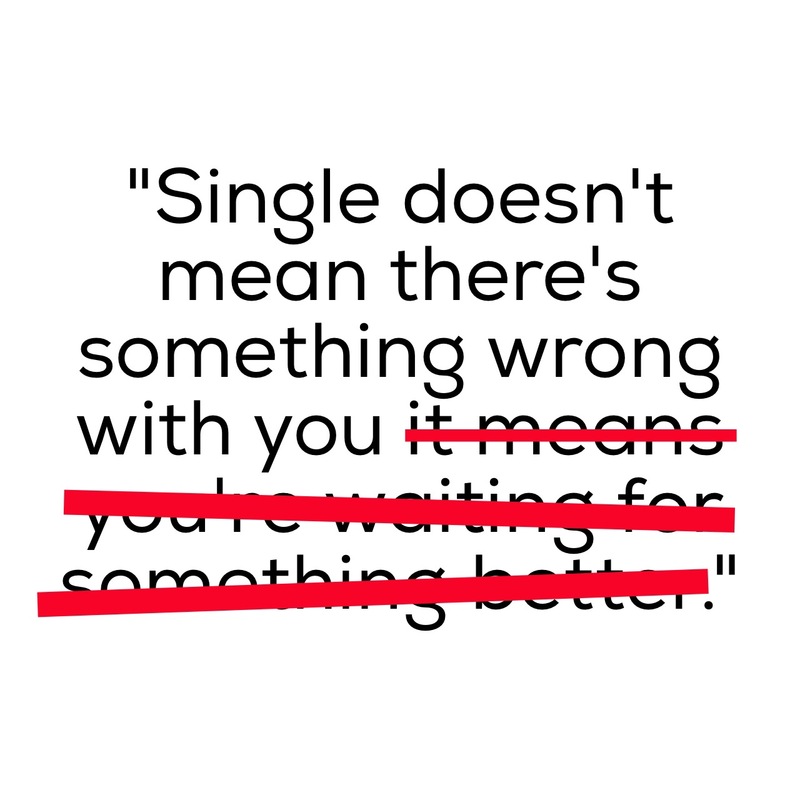 You’re probably not single because there’s something wrong with you. Firstly, some of you haven’t even had the chance for a prospective partner to find out what’s wrong with you. And secondly, look around – have you seen some of the people who ARE married? There are some twisted, broken, weird and altogether unpleasant people who are married! There’s stuff wrong with them and they’re married! Here’s a word of advice for you without the price of the coffee. Take the question off the table. Move on to more productive spends of your emotional energy. One year ago this God-dream was finally birthed (the “finally” was about me finally cooperating more than any delay on God’s part)! This book has made it into the hands – and its message into the hearts – of Singles, marrieds, leaders, parents, mentors, friends, Pastors and interested persons across the country and the world. My greatest hope has always been that it would encourage a conversation and spur people on to deeper understanding of the unique needs of Singles and grow us all in the greater cause of embracing and connecting with one another. I have been continually encouraged by the feedback I’ve received, the opportunities it has facilitated and the people who have shared their stories with me in return. What a year it has been! It’s so great to pause and reflect on all that has passed. But it’s not done yet, I’m sure. Even though this book was finalised in print, the story is still being written. Thanks for being part of it!!! That’s my main take away from a year of publishing, releasing and talking about my book on Singleness. God can bring great fruit out of stuff you just really REALLY don’t want to be doing. Listen HERE to the sermon I preached at my home church on Sunday Jan 10th about how it’s okay to be not okay with what God is asking us to do – but the call on us is to submit to His greater plans and purposes. Jesus’ time in the Garden of Gethsemane as He wrestled with and then surrendered to God’s plans for the redemption of humanity through His sacrifice, reminds us that more is at stake than we could ever know and being in the centre of God’s will is always best even if it doesn’t feel best. Who doesn’t love a well phrased, inspirational quote? Sometimes you come across them on social media or in print and it just hits the right spot for the right time. I am also partial to a humorous quip. Because I love to laugh and they can provide a good chuckle. But then there are those quotes that just get under my grill and make me mutter to myself like a crazy lady. And mostly they’d be the ones that are to do with Singleness and include the word “waiting”. Hear me on this, I do get what these quotes are trying to say. I understand they’re intended as an encouragement and certainly not pieces put forward for literary review. But when I read “waiting” in these quotes it makes me think of the waiting room at a doctors surgery. Just sitting there surrounded by pale grey walls, watching Nutri-bullet advertisements on the TV, flicking through New Idea mags from 1999 and wondering how many illnesses I can contract from the other patients around me while I wait 45mins for my 7min consultation. Waiting in that instance suggests stagnancy. Waiting implies that “now” is insufficient or inadequate. Waiting infers inaction until the desired outcome is achieved. The idea of waiting potentially speaks into our spirits a “when” or “if” attitude – when I am married I will “x”; if I get married then I can “y”. And ultimately that kind of waiting robs us of satisfaction in the now. It detracts from our ability to embrace what is instead of pining for what might one day be. Here’s the list of things I CAN do while I’m not married. And here’s the list of things I CAN’T do until I’m married. Ok ok. That’s a tad over-simplified. And trust me, I get it, there’s no one who wants the married stuff any more than I want the married stuff. But my point is this – when we start talking about waiting we can unconsciously add things to the second list that don’t belong there. If waiting (in the sense I described) is a term that describes your Single life – you’re doing it wrong! If you’re holding off on anything on that first list because you’re Single, can I suggest a re-think? Here are my creative re-writes of the above quotes. Feel free to turn them into inspirational posters (referencing me, of course)! It was great to have a chance to chat with the team of Focus on the Family Australia. The feedback Focus on the Family has had over many years is that this topic isn’t discussed that often so it’s great to be part of bringing it to the fore. There’s some strange vulnerability associated with having a very unknown listening audience but I keep trusting that it’s landing on the right ears, encouraging the right hearts and advancing the conversation in all the right places. “Every time another friend gets married it hurts more.” – a Single person. Well, actually, many Single people. It seems a commonly experienced emotion among those desiring to be married – the pain of watching others experience what they are waiting and longing for can be intense. My personal journey with jealousy is well documented (see a blog sample here!!) and an engagement, a wedding or a birth announcement are certainly able to flick my jealousy switch. But one thing I try and remember in the midst of that emotional response is that marriage is not a numbers game. Marriage is not a numbers game. Each wedding that happens is not actually making it less likely that I will get married. There is not a finite number of weddings that can happen in my lifetime and every time one happens my odds decrease. I know we know that, but sometimes it’s easy to forget we know that and add another layer of despair to our grieving. We say, think or hear things like “well, there aren’t many good Christian men left in your age bracket!” Or, “you do live in an area where there aren’t many Single people!” Here’s the deal, we don’t need many we only plan/hope to marry one. Whether that one is one of a thousand or one of one is not the point. You just need your one. The Bachelor is a TV show not a real life phenomenon. You don’t need to start with twenty-four to find the one. The process of discovering your life mate is not a game of comparisons. You don’t need to like Bachelorette number 11 more than Bachelorette number 3 in order for Bachelorette 11 to be your future life partner. The qualities of an individual person stand alone and should be interpreted in relation to how you are or are not suited – not because they beat out another person in an apple bobbing competition or some other randomly determined measurement of their true feelings for you! But stop! Before this becomes a rant about the inherent stupidity (and oh so appealing watchability) of the Bachelor franchise, hear my point. It is not a numbers game. Another wedding does not make you more Single. You are not more or less valuable, likable, dateable, husband-or-wife-able the day after a friend’s wedding than you were the day before. Undoubtedly the moment of celebration for another person can be a poignant time of heightened emotion, longing or grieving but let’s not add an unnecessary element to that emotional cocktail. It was great to be at Moolap and Barrabool Hills Baptist Church on Sunday across all three of their services. Seated in one of the services was a lady who had recently lost her husband … and when I say recently, I mean super recently … 4 days earlier! She was there with a girlfriend who had come to stay with her – clearly still in that numb state of shock and disbelief that can often accompany grief and loss. But they were both blown away by the sovereignty of God to have her sit under a message about the importance of community and family for the Single person. Her girlfriend was challenged to understand the new needs and challenges that were ahead of this newly widowed lady. They bought a copy of the book for them both to look at in the weeks and months to come. What do you say to someone who is processing such grief and loss? She was so convinced of God’s timing and provision of this message (& the book) and we were able to agree and affirm that God clearly had her number. While everything else ahead of her is uncertain right now – she can be sure that God is right there with her in it. On Sunday I will officially become something I’ve been trying to avoid for many years -“that Single girl”. Alongside my general propensity for procrastination, one of the reasons the project didn’t happen for so long is that I didn’t want to be “that Single girl”. I didn’t want my “life’s message” to be about singleness. I didn’t want to be some sort of singleness expert. Even as my experiences accumulated and my understanding of the Single life (mine and other’s) deepened and even as I saw (from both positive and negative examples) the significance of the interactions between Singles and the Church family – I didn’t want to be the one to champion or steward the message. If I’m going to be the “voice” of something couldn’t it be marriage or parenting or … or … underwater basket weaving!?!?! Anything but singleness! Last year, God’s long-suffering and gentle prodding shifted gears and He came at me with a multi-fronted attack – “Write the book already!! Just do it! !” So, while I may be good at procrastinating and excuse-making, when it comes to wilful disobedience I’m no dummy! In fact, another friend prophetically declared it my “book of obedience” and as I followed God into the project He opened all the doors and His provision was generous and sure. 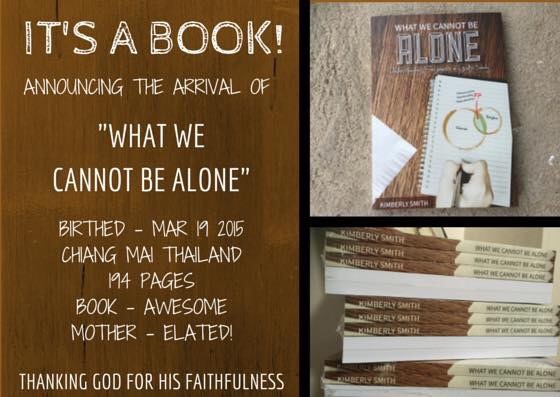 The book was published in March and has been seeping out to various individuals, leaders and churches since then. (Order your copy HERE) I am so encouraged by the feedback it’s received. God is using it to bless, encourage and challenge His family. I love that God works that way – He takes our humble offerings and breathes His Spirit of grace and truth into them and they bear fruit in the lives of His children and for His Kingdom purposes. And we get to participate with Him! It’s been such an exciting project to be part of. But now, as I prepare for my first book-related speaking opportunity, I find myself needing to process a fresh wave of …well, I’m not exactly sure what it is. Grief? Disappointment? Resistance? I have to step on the platform and be “that Single girl”. You know, the one who is so Single she’s written a book about it!? 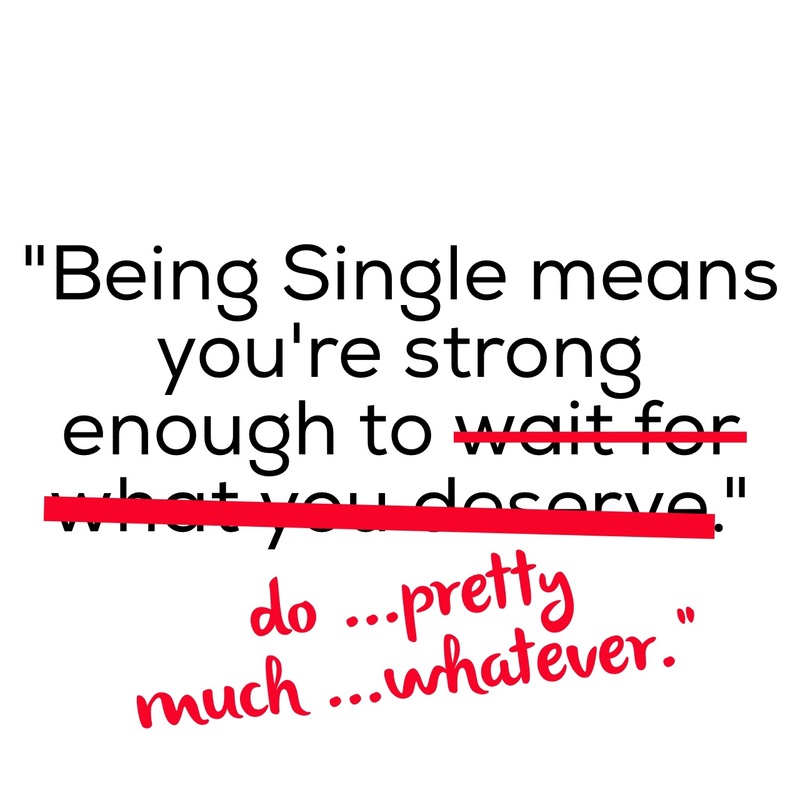 While there are some potential positives to such a public declaration of singleness (my mum has long hoped for me to make my status part of my introduction anytime I’m speaking to a new audience) there’s a work to be done to sort through the “stuff” to get to a place of greater celebration and expectation. I’ve rarely been as sure of God calling me to a specific assignment than I have been with this book. I am thoroughly convinced of the Church’s need to hear and respond to the message it contains. I am 100% committed to seeing this book reach the full intent for which God commissioned me to write it. But the reality is there’s﻿﻿ a cost. There’s a surrendering required. There’s a setting aside of my own agenda, pride, embarrassment, or disappointment in order to free my hands to embrace all that these opportunities will no doubt contain. So I will be “that Single girl” …and anything else He would ask me to be … trusting His timing, being confident in His calling. Even if I’d have chosen something else, I know He has chosen me for this and this for me.